Don’t let it just sit in the bank. With low-interest rates from 0.5 to 1.5%, you’re better off investing it elsewhere. And even if you don’t have a lot of cash saved up, there are still many ways to let your money work for you. For many young professionals and entrepreneurs – in this information age – it’s conventional wisdom to consider investments early on. Especially for young Filipinos, the time to think about investing is NOW. If you want a more secure and brighter future for yourself, you shouldn’t put investing on hold. An investment is a purchased item or asset that a buyer can identify as something that would appreciate its value in the future and can be sold at a higher price. It can also be viewed as an asset that can enable its owners to generate passive income and create wealth over time. Investing is using your money as capital to buy assets that can produce more money for you in the future. It’s basically letting your money do the work for you. Stocks, Bonds, Annuities, Commodities, Real Estate and more. I bet we all scratched our heads the first time we tried to know more about these financial terms. We get overwhelmed with all the technical jargon and get buried with a ton of information that just doesn’t make sense. 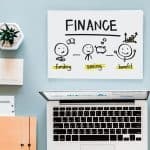 This guide aims to shed some light on the different types of investments available out there to help you achieve your financial goals. Learning about them will open up ways and ideas for multiplying your money quickly. Perhaps the most popular and common of all investments, Bank Products come in different options. The money you deposited are federally insured to up to a certain limit and can be easily withdrawn. The following are types of Bank Products: Savings Accounts, Certificate of Deposits (CDs), Money Market, and Federal Insurance. Bonds are loans offered by an investor to governments and corporations. In exchange, the borrower will pay the interest on the borrowed money at a predetermined schedule (Annual, Semi-annual) and will need to return the principal on an agreed upon maturity date. Put simply, Stocks are units of ownership in a corporation. This means that if you own or invest in stocks of a company, you become one of its “owners”. Capital or Money that is sourced from different investors. A mutual fund is one of the most common types of investment fund. Money that gets paid at fixed intervals to an individual at an agreed upon time. That individual will first need to pay for the Annuity in one lump sum or through a series of payments also known as “Premiums”. Saving money for college expenses in the future. Earnings of the money deposited in a College Fund are not subjected to Federal and State tax (depending on the location) as long as the funds are strictly used for college expenses only. Simply put, money that you put into a business to gain (active or passive) earnings or income. A way to have income cash flow upon retirement. While still able, workers can put money into a Retirement Fund and receive pension once they retire. An agreement or contract designed to buy or sell a specified amount of a commodity at a fixed price and future date. This helps protect buyers by negating risks caused by fluctuations in price of the commodity in the future. Similar to Commodity Futures. However, instead of commodities, its an agreement to purchase and sell a fixed amount of shares of a particular stock at a specified price on a specified future date. Insurance is essentially protection against potential financial loss, damage or harm. The Insured/Policyholder pays “premiums” to buy a “policy” that states the terms and conditions in which the insurer is required to pay. Real Estate investing aims for the generation of income or profit through purchasing, leasing, managing or selling a piece of realty property for a higher price than it was acquired (when the property’s value appreciates over time). Alternative and Complex products are other optional investment vehicles outside of traditional stock and bond investments. Some examples of this are Notes with principal protection and risky high-yield bonds that have low credit ratings. Most are risky but provide high rates of return. If you’re just starting out as an investor, you don’t need five or six-digit figures from the get-go. Anyone—even college students and fresh graduates—can start investing with as little as Php 25 to Php 5,000. The actual initial investment depends on where you’re putting money in and the bank or investment company that will handle your funds. The advantage of growing your money through investments is that you can start small. There’s no excuse not to get started even if you’re a breadwinner with a lot of bills to pay, as you can increase the amount you invest later on when you’re more financially capable. But it’s important to note that you should never begin an investment journey without a solid strategy. Take these initial steps to invest even with a small amount of money. This step is crucial if you plan to invest regularly in the long term. You don’t want to invest a certain amount initially and then stop it altogether after a few months because you could no longer afford the monthly, quarterly, or yearly investments. Before you start off, set a realistic and reasonable amount to invest, taking into account your income, expenses, and savings. A common mistake many first-time investors make is jumping right into investing without having an emergency fund. When a financial emergency happens (like the hospitalization of a family member or the need for home repairs after a typhoon) without emergency funds stashed away, you’ll have no choice but to withdraw your funds or sell stocks prematurely. Ideally, you need to build an emergency fund equal to six to 12 months’ worth of living expenses before starting to invest. Make the process easier by putting away a small amount every week or payday. The Philippine Stock Exchange (PSE) recommends putting the emergency fund in short-term, liquid investments such as savings accounts and time deposits. You can invest the rest of your savings in medium-term or long-term instruments, depending on your financial goals. Look for investment opportunities that allow you to begin investing with a minimal amount. The best investment vehicles for this purpose are mutual funds and UITFs. When you put your money in these instruments, you can invest in a diversified portfolio of bonds and stocks with just a single transaction. 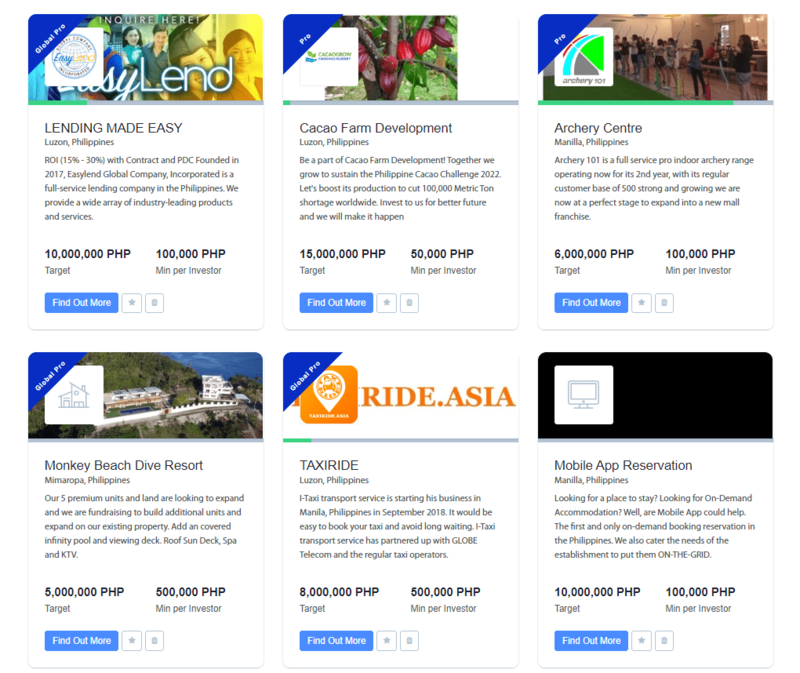 Here are your options in the Philippines with initial investments ranging from Php 25 to Php 1,000. 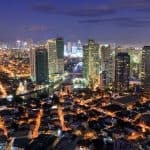 Here are the 12 best investments in the Philippines that every hard-working Pinoy should consider. Life Insurance is something every young professional should consider. Having an insurance is necessary if you’re thinking about getting a house or a car. But more importantly, insurance is a must if you want to ensure that yours and your family’s lives are secured. Did you know: Only 47% of the Philippines’ population have life insurance (while US have 59% of its population insured). Something that people should look into is a Variable Universal Life Insurance or (VUL). According to Investopedia, a VUL is a form of cash-value life insurance that offers both a death benefit and an investment feature. It is basically a type of insurance bundled with an investment component. You’re insured but you can also have the option to invest your money. It’s ideal because you get the best of both worlds. Aside from that, there are other benefits to VUL that differentiates it from other traditional insurance policies, such as flexible premiums. Any excess amount you add to the premium will go to your accumulated funds. In case of a financial emergency, on the other hand, you can choose to only pay the charges without the plan lapsing. And speaking of financial emergencies, one great feature of VUL is its liquidity. You can still access your funds in times of need. And unlike traditional policies, this is treated as a withdrawal and not a loan. Meaning the amount withdrawn does not incur interests. Although it is encouraged that whatever amount was withdrawn should be immediately reinvested to keep on track with your financial goals. Do you really need life insurance? – Ask yourself if you really need insurance. If you have dependents then the answer is probably yes. But if you’re a single career person with no family as of now. You can consider putting it on hold if you don’t have the extra cash to spare. How much do you need? – If you’re thinking about retirement, ask yourself what your projected retirement fund will be. Will it only cover the replacement of your actual income or will it include expenses for leisure? That’s something to think about when getting your plan. Get Quotations and Plans from Insurance Companies – Call different insurance agent and ask for quotations or get them to send you proposals through email. This way you can pick and choose what would be the ideal plan for you. Most insurance agents now have tools that generate quick client policy proposal. Avoid Additional Insurance or Add-Ons – A lot of the agents you will encounter will push for additional insurance or add-ons because of targeted quotas which will mostly just benefit them and the insurance company. Stick to your basic life insurance. But it is advisable to get a critical illness add-on. You may never know if or when you’ll get a serious health problem. Get an Independent Financial Planner – Agents have a tendency to be biased about plans because of their quotas. So, it’s advisable to get an independent financial adviser who is paid to advise you and not to reach quotas based on plans and add-ons. It’s not necessary to do this but if you have extra cash to spend on a financial planner, get one. Get it now – The younger you are the cheaper the plans are. There’s no time like today to get a plan. Stable – Of course you have to make sure that the insurance plan you’re getting is from a reliable and stable company. Call the insurance company, or the insurance commission, and search the web. Look for reviews and research the company. Make sure they are legit. 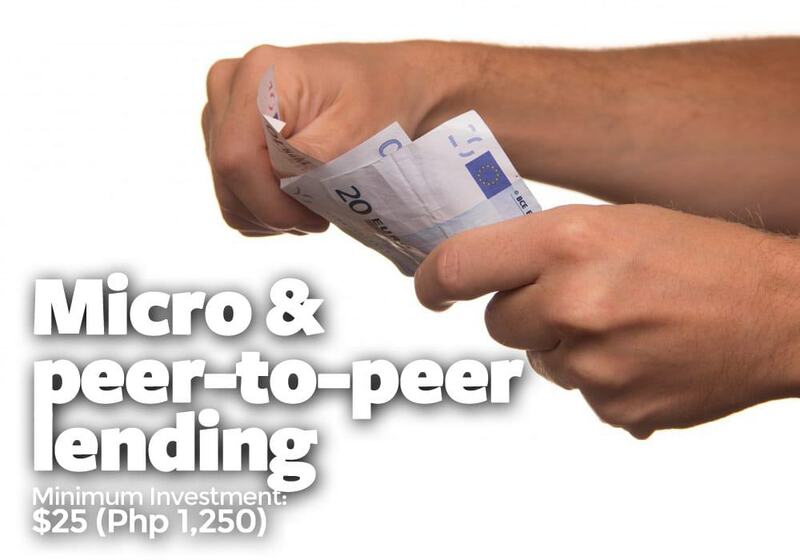 Another investment option young professionals and investors can get into is Micro-lending and peer-to-peer lending. Peer-to-peer lending is the borrowing and lending of money through a platform without going through traditional means like the bank or other financial institutions. What happens is, usually, an online company will bring together borrowers who need financing and lenders who would like to invest their money and earn through interest rates. People are attracted to P2P because it cuts out the middleman – which is the bank, and provides better deals for both the borrower and the lender. Because rates are a lot flexible compared to banks, borrowers can get relatively cheaper interest rates while the lender can still profit from a decent amount of interest rate. Here are some tips to consider according to Paula Pant, from Student Loan Hero. Research before you invest – This should be a no-brainer but it is something you must keep in mind. Research about the loan history of the company you’re going to choose to invest in. Look into things such as the percentage of borrowers who default (unable to pay back) and how they screen the borrowers. Also ask about the average returns of investors in the past and how they handle late payments. Know your risk tolerance – “Think carefully about how much risk you are prepared to take, bearing in mind that you could lose the whole of your investment in a loan if it defaults,” wrote Graeme Marshall, CEO of FundingKnight. Go slow – You don’t have to invest largely in one borrower. Take advantage of the fact that you can start investing at only $25. Diversify your loans – As what was mentioned earlier, you don’t have to go big with just one borrower. Diversify your loans. As the saying goes, don’t put all your eggs in one basket. Reinvest your returns – You don’t have to cash out your returns once you can. Consider reinvesting them into new loans. People may stay away from stocks because of having no knowledge about it. Most even just prefer to let their money be stagnant and stay in a bank. But knowledge can be acquired so it shouldn’t stop you from investing in stocks considering it could make your money grow exponentially. Investing in stocks allows you to buy shares of companies, you won’t be able to buy under normal circumstances, said Marvin Germo, author of Stock Smarts. “The stock market gives you the opportunity to buy in companies, like partnering with SM, GMA, Jollibee,” he said. Learn everything you can – Being too confident in the stock market can also be too risky. Learn from the books and experts first. Do your research, learn the terminologies and all the tricks, buy books, and attend seminars. If you can, get a mentor. Do everything you can to be knowledgeable on the stock market. Know your risk profile – Are you cautious or are you a risk taker? Your personality should reflect the stocks you buy. According to Marvin Germo, there are stocks that are volatile, with a great potential to go up but also a great potential to go down. Some are just steady but when the market goes down, the impact to the company won’t be as bad. Consider what type of stock would fit your level of comfortability. Buy Low Sell High – Buy stocks only when the price is below the “Buy Below Price”. The Buy Below Price is a level at which capital appreciation potential is already attractive relative to the fair value estimate. Any price below this is considered optimal to buy. Don’t expect money to double soon – According to an investor interviewed by Rappler, you shouldn’t expect our money to double within a year. In fact, you should be prepared to hold on to our equity investments for a longer period. 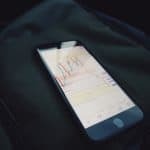 Want to get started with stock trading and investing? Check out our Beginner’s Guide to Stock Trading and Investing. What are Mutual Funds and UITF? 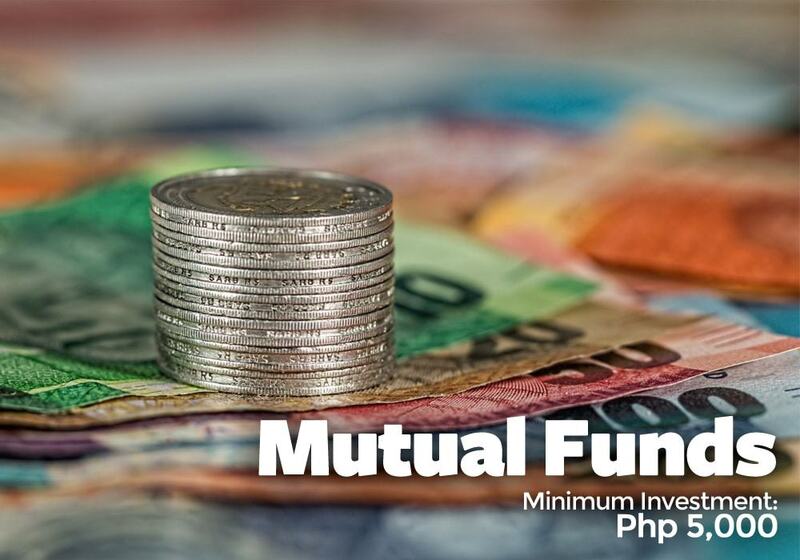 A Philippine Mutual Fund is an investment company registered with the Securities and Exchange Commission (SEC), which pools money from many investors creating a massive fund under a common objective. This fund is then invested in specific types of securities to achieve the stated objective. UITF or Unit Investment Trust Fund, on the other hand, has the similar functions of a mutual fund, but the main difference is that the fund is managed by a bank (instead of a mutual fund company). This type of investment is ideal for young and new investors because you’re investing your money to experts who would know what to do to make your money grow. Money Market Funds –invest purely in short-term debt instruments (one year or less). Bond Funds– invest in “bonds” which are really long-term debt instruments offered by governments or corporations. Balanced Funds– invest in a mix of shares of stock and bonds. Stock / Equity Funds– invest primarily in shares of stock. Go with Competent Fund Managers – You’re basically entrusting your hard earned money to a third party company. So you must ensure that the fund managers they have are competent enough to bring growth not losses. A good way to know is to look at the consistency of the fund performance at least in the last five years. Add Regularly – Although you can start at a low price of Php 5,000 and there is no required regular addition. It is advisable to add regularly and use it as kind of your piggy bank for your long term goals. Assess Risks – All investments have their risks, so it’s important to do risk assessments. Online brokers who offer mutual funds usually have their risk assessment questionnaire which will help you decide which type of mutual fund is best for you. Set Goals and Objectives – Like with any other investments you must know why you’re investing. Is this for your retirement, leisure, capital for your future business endeavors? Be clear on where you want this to go to make the best decisions. Newbies may become disheartened when they see losses even if they still haven’t reached the end of their time frame. As with stocks, you must be patient enough to see your investments grow. 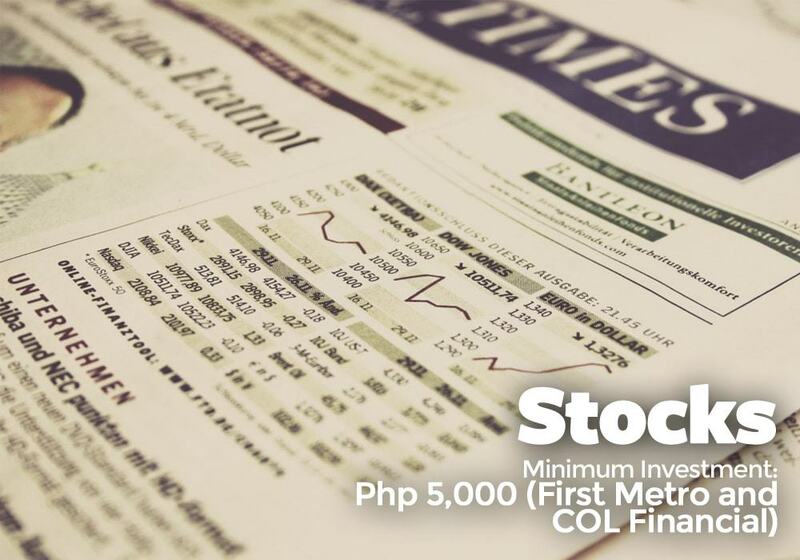 Best Mutual Funds in the Philippines – curated by SavingsPinay. Small business is another investment that you shouldn’t pass up. A lot of people might not be inclined to try this out because of the fear of failure. But why should that stop you? Failure is just a part of life and taking risks is important if you want make your money grow. But if you’re still apprehensive, you could always start small. With just 5,000 pesos, you can get into the food business. You can go with street foods, gotohan or mamihan. If you’re the type of person who likes Karaoke, with a few more money (around 25,000), you can do Karaoke rentals. 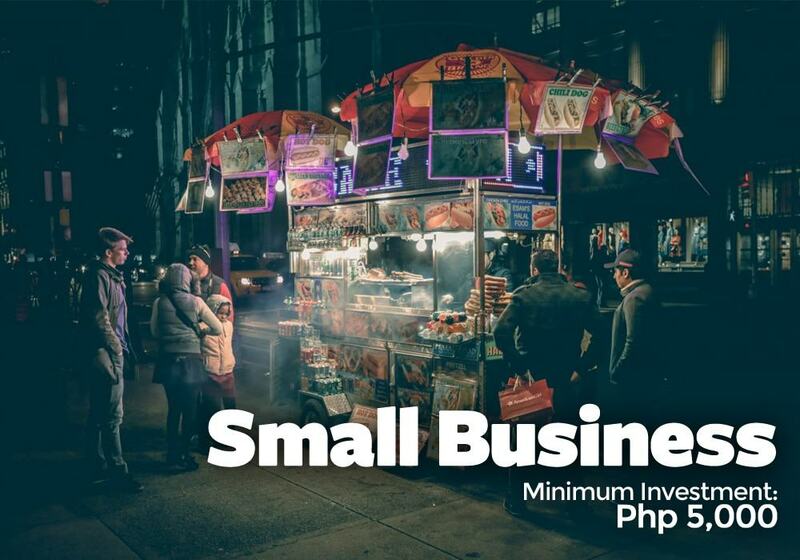 There are several options for those who want to start a small business for under Php 100,000. You can also check out our massive list of small business ideas. Find your passion – A lot of people wonder what they should sell, finding your passion can be important because it will help you push through with your business even if the going gets tough. If you have the passion for fashion, selling clothes would be ideal for you. Do Market Research – The thing about most Filipinos is that, when they think about starting a business, all they think about are the basics like where to get capital and what product to sell. Those may be the main things, but market research is always important in any type of investment. You have to know your products/services, your competitors, your demographics, trends in the industry, things like that. Secure Funding – Your funding will cover 2 types, Pre-operating (equipment, stock, deposits, permits, etc.) and Working Capital (salaries, rent, utilities, supplies, and contingencies). It’s advisable to secure funding for at least 6 months of operation. Build a website – We live in the age of the internet and social media. So, having a website is essential these days. Your website is the digital address of your business. And it’s also basically your digital store. Having a website or at least a social media account can provide you with a digital presence and also social media marketing opportunities. Network with other people – The more there are of people who know about your business, the better the business will be. So, as was mentioned above, online presence is crucial. Word of mouth is also great, but you get a wider audience through social media. Connect with people both online and offline. Attending seminars and business conventions is also a way to network. Consult Experts – Getting a mentor or at least some form of advice through experts is always important. You will learn from the experiences of those who have made it. If you can’t find a mentor in person, find mentors in books or go online. Watch seminars on Youtube or search for business articles written by experts. For those who would like to own houses through installment, there are cheap mortgages that would only cost Php 2000 – 3,000 a month. Another investment to of course consider is real estate. If you’re thinking about owning a property but you’re wary about how much you want to spend, you may consider buying Foreclosed Properties to get a cheaper deal. For as low as Php 11,000 you can own a foreclosed land. Know where to look – To find foreclosed properties, go to banks, Lending Institutions, SPAV companies (companies formed under the Special Purpose Vehicle Act of 2002 to help banks shed their nonperforming assets), and government financial institutions like the Social Security System (SSS), Home Development Mutual Fund (Pag-IBIG Fund), and National Housing Authority (NHA). Get Your Financing Ready – When you already have a housing loan approved by the bank, sellers will take you more seriously. And so, you’ll get more negotiating leverage compared to other buyers. Attend Property Auctions – Attending these auctions will be a great way to discover properties not usually on online listings. Inspect the Property – You shouldn’t ever buy anything without properly inspecting it. You must see for yourself if it’s worth your money. Know your fees and taxes – Other than the down-payment and the property’s selling price, there are also fees and taxes charged to the buyer. For example, buyers must take care of notarial fee, registration fee, transfer tax, and documentary stamps tax, and if you’re buying a condo or townhouse units, the buyer will also be required to pay monthly association dues. Be Goal Oriented – Ask yourself what you want to achieve in real estate investing. This way you can have a vision of what you want to get from investing and will also keep you determined. If you think real estate can be the easy money you’ve been searching for, well nothing in this world can really be called easy money. There will be challenges but having a vision and determination can keep you in track. Learn as much as you can about Real Estate – You need to familiarize yourself with the “ins and outs” of real estate transactions in the Philippines. Do research on the subject. Attend Seminars – Just as was mentioned above, you’d have to learn a lot about real estate and one of the best ways to do that is to attend seminars and conventions on real estate. Not only can you learn from experts but you can also check out potential properties. Join or start your real estate investors club – This is a great way to network and find out more from fellow investors. If you’ve never heard of Bitcoins or cryptocurrency, don’t worry. It may be an unchartered territory for many people but it’s basically a simple concept. 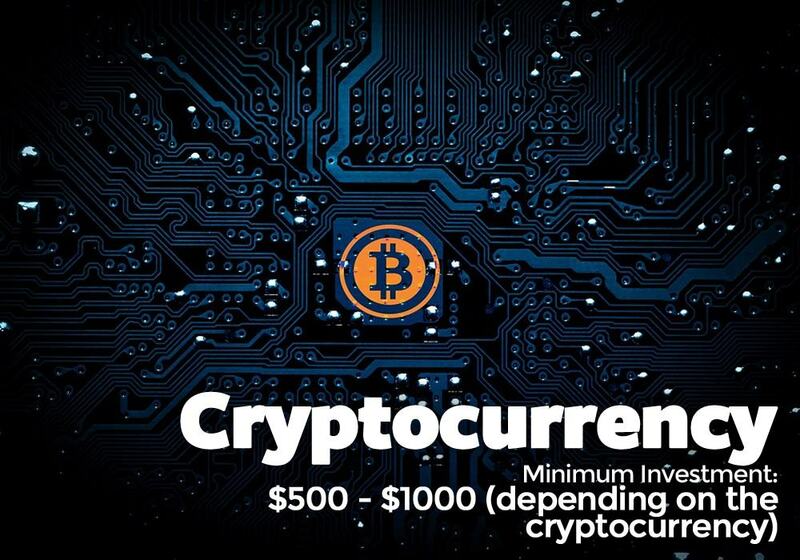 Cryptocurrency is simply digital or virtual currency that people on the internet use to trade. It uses cryptography for security to ensure the safety of the traders. It’s most appealing feature is the security from the government that it offers. Because your currency is encrypted, the government can’t monitor it. Bitcoin is mainly the most well-known type but there are other types of cryptocurrencies that are actually cheaper and might be more ideal for you. Now you may try to avoid this because of the sketchy ways cryptocurrency can be used. But Bitcoins and cryptocurrency are legal depending on where you are and what you plan to do with it. The Central Bank of the Philippines has issued a warning on virtual currencies but has stated that they are not subject to any regulation. Educate yourself – As with all types of investments, you must be knowledgeable on where you’re putting your money in. Coinpursuit and Slicefeeds.com are just some of the sites you can check out to educate yourself. Treat it as you would the stock market – Analyze trends and patterns on weekly charts. 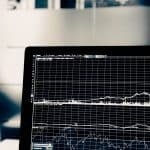 Analyzing fundamental data is key in your methodology to find a decent investment opportunity (you can also check out our guide on how to research altcoins). Invest in Fund Management Platforms – As was mentioned above, cryptocurrency can be treated like stocks where fund managers can handle your investment. You can even invest in mutual funds. Use it to solve problems – Find opportunities to use cryptocurrency to solve problems such as providing an alternative to traditional banking services. Some people cannot get access to traditional banking services whether due to geographical reasons or other circumstances. You can use this opportunity to provide access to products and services people cannot otherwise acquire. Crypto to Money – Don’t forget that Cryptocurrency can be exchanged for money. You can use this to trade with people who are in need of cryptocurrency for products and services physical money cannot buy. Check out our Beginner’s guide to Cryptocurrency Investing. Buying a website is something you should definitely consider. If you don’t want to go through the hassle of building a website and gather an audience for that site, then buying a readymade one that’s already profiting is definitely advisable. It’s a great and easy way to acquire a passive income. 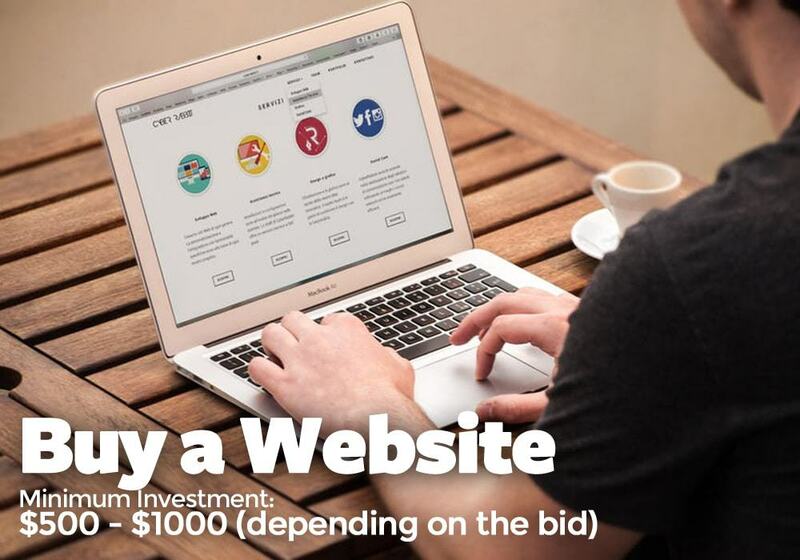 You can check out Flippa.com to look for websites being auctioned. Know the History – You must know about the site’s history before buying it. Know about its net worth, how old the site is, and if it is legit. Just because it’s saying it’ll earn you $10k a month doesn’t mean it really will. Usually the older sites are the most trustworthy ones. Be familiar with the Platform – Is it WordPress, Joomla, or something else. This will make it easier for you to know the experts who can operate the platform. Demographics – Find a site that targets the demographic you want to reach. Traffic Quality – The more the visitors, the more money you’ll earn. Maintenance Cost – How much will this site cost to maintain? How many staff do you need to run the site? These are things you must consider. Price – Something to definitely consider to make sure the site is legit, an average site would cost around $2500. Although there are sites that cost lower, this can be considered a red flag. According to FXCM, Forex, also known as foreign exchange, FX or currency trading, is a decentralized global market where all the world’s currencies trade. The forex market is the largest, most liquid market in the world with an average daily trading volume exceeding $5 trillion. 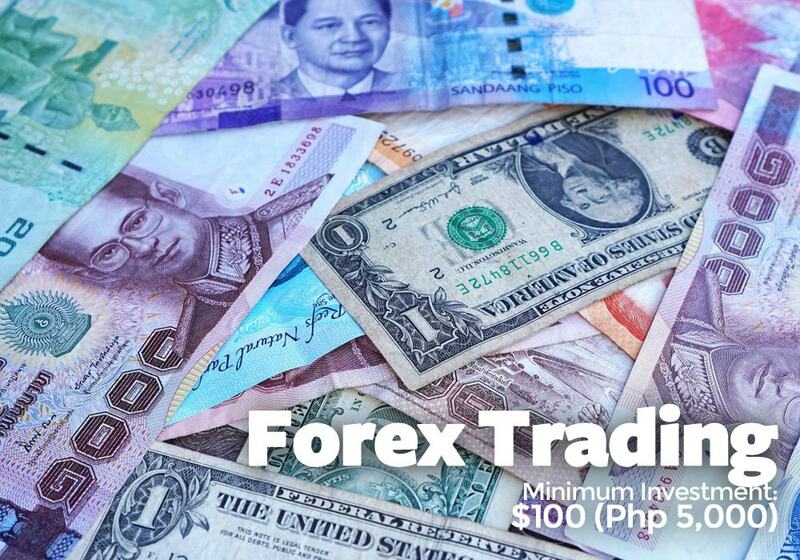 So, it would really be advisable to dip your toes into foreign exchange trading if you want to grow your investments. Choose a broker wisely – Choose a broker that will allow you to do the analysis you require. You must know each broker’s policies and how he or she goes about making a market. Choose a methodology and be consistent in application – Remember that fundamentals drive the trend in the long term, whereas chart patterns may offer trading opportunities in the short term. Whichever methodology you choose, remember to be consistent. Perform weekend analysis – At the end of the week, when the markets are closed, review and analyze weekly charts to look for patterns or news that could affect your trade. Practice Makes Perfect – Like with any practical skill, trading is something you learn and improve on as you go along. You won’t be an expert on your first try but with constant practice you can be successful in the Forex trading business. Let’s break it down real simple. Say you want to launch your own food delivery business but don’t have the capital to begin with. After hearing about your plans, your uncle offers the necessary funding. You’re tito is an Angel indeed—an Angel Investor, to be exact. Often called “informal investors”, they are affluent folks who provide capital funding to start-ups in exchange for some gain or equity in the business. Continuing with our scenario earlier, the money you received from your uncle is called “Venture Capital”. If you’re familiar with the tech industry, you hear about this a lot. Uber, Twitter, AirBnB, and a host of other big-name companies all received venture capital to kickstart their business. In return, their success brought sky-high gains to their investors. It refers to monies or funds not included in a publicly listed exchange (e.g stock market). Funding injected by investors into a company in exchange of 100% ownership or control of the company is what makes Private Equity different from Venture capital. This site stands as a middleman between entrepreneurs needing funding and investors. 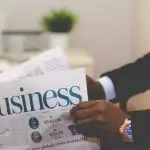 Once you’re registered as an investor, you can proceed to choosing among the list of business proposals that you deem most worthy (and profitable) of your investment. Most people don’t know this, but you don’t need to be uber-rich to be an angel investor or venture capitalist. If we’ll use our scenario earlier, your food delivery business might only need Php 100k to get everything up and running. It really depends on how big the project is and how much capital it requires. There are a ton of established businesses in the country that are looking to expand, which you can easily fund for as low as P50,000. As an investor, your main job is to provide funding. However, the success of your picks will highly depend on how well you understand the nature of their business. Most successful angel investors and venture capitalists are stringent in their selection process, often going through several rounds of in-person meetings and reviews. This helps in making sure they are not betting their money on a high-risk venture. It wouldn’t hurt to try asking for an hour of their time to get a primer on the whole thing. A simple gesture of taking them out for lunch to pick their brains may work surprisingly well in some situations. Most of these people are kind enough to share their knowledge. And if they can’t meet you face-to-face, online correspondence is still highly valuable. When we invest in something, it’s usually on something we truly believe in, or very familiar with. Why? Because it takes out a lot of the guesswork figuring out stuff from the beginning. Your existing knowledge about the product or service allows you to ask the right questions. It also gives you better insight on the future and success of the venture. In just a single investment, that is. As cliche as sounds, “spreading your eggs in several baskets” also applies in venture capital. Not only will it allow you to lessen the risk, it also opens up your pool of money to more promising investments (negates opportunity-loss). World-renown investor Ray Dalio operates on a set of core “Principles” (the title of his book) that serves as his checklist to guide him on decisions—both in life and investing. What’s my expected ROI and when will I hit it? How much capital am I willing to invest during the course of the start-up? What type of involvement does this company require from me? Or better yet, several others. Investing is risky. In fact, most venture capitalists in the US fail. If you’re just starting out, it might be a good idea to team up with others so you won’t have to shoulder the whole start-up capital. Sure it will reduce your potential gains but at least you’ve significantly reduced the risk. How do Angel Investors make money? After putting in significant funding into a business, Angel investors recoup their investments (and more) once the company starts seeing success. For example, an app or SaaS-type of company may begin growing its user base and starts getting paid for their offering. This influx of revenue will naturally result to growth and increased chances of getting really massive (Uber, AirB&B to name a few). While it’s mostly a hit-or-miss situation in the VC industry, the potential returns are enormous when you chance upon a real winner. It is said in the US, the average industry standard assumption for getting a winning portfolio is 10 investments. Out of the 10, 6 will most probably be losers, 2-3 might break even or give slight gains, and (hopefully) your last one hits home run. The winning pick should be big enough (10x your minimum investment) to make the whole thing profitable. Established through Republic Act 9505, the Personal Equity and Retirement Account (PERA) is a voluntary retirement investment program. It takes after the 401(k) and Individual Retirement Account (IRA) in the United States. This long-term saving program aims to serve as an additional source of funds upon retirement apart from GSIS or SSS pensions or any form of retirement benefits from an employer. PERA is a purely voluntary retirement savings program that allows the contributor to earn tax incentives from the amount he or she invested. Those who choose to sign up for the program have to make certain contributions every year until they reach 55 years of age. Upon retirement, they’ll reap everything they invested, not to mention all other proceeds earned from the contributors’ PERA account. Some benefits of PERA include not being required to pay tax from all income earned from PERA when the contributor retires or die and 5% income tax credit until the contributor turns 55 years old, among others. With the 5% income tax credit, you’ll get 5% off your annual taxable income allowing you to save more money in the long run. Contributors can withdraw from PERA once they reach 55 years of age provided that they have made contributions to PERA for a minimum of five years. In case of death, the funds invested by contributors in their PERA account will be distributed to their respective heirs. Or if they have declared beneficiaries, the proceeds will go to them at this point. Find an administrator to manage your account. You can either choose between BDO or BPI. Remember, you can only have administrator, so choose wisely! Assign a custodian to receive your funds. Make sure the person or entity is officially recognized by the BSP. Select the PERA investment product you wish to invest in. You may choose from stocks, UITF, government securities, mutual funds, insurance products, and other accredited products. If in the future you wish to distribute funds but have not yet reached the required age, you can still do so but not without penalties. Remember that there are only two qualified cases of distribution for PERA funds–death and retirement. Distribution of funds that do not meet these requirements will result to having to compensate the government for the total tax incentives you got, including the 5% income tax credit, waived income tax for employer’s contribution, and waived taxes on the total investment income. When a contributor needs to claim it after being considered “permanently totally disabled” . When a contributor needs it for payment of hospitalization for more than 30 days due to an illness or accident. When the proceeds will be transferred to an eligible PERA investment product or administrator not more than two working days from the date of withdrawal. Supporting documents such as certifications might be needed for the first two exceptions so make sure you secure them from the proper authorities before presenting your case. Investing in new skills and yourself is something that people tend to forget but is very important whether you want to invest in business or not. You don’t have to go to a formal school to learn new skills. But if you have the money, you can take courses or even get a post-grad degree. Online Courses – Take online courses which are usually cheaper and may sometimes even be free. Take courses on starting your business, choosing the right investment, financial planning, blogging, SEO, marketing, anything under the sun. There are infinite courses to choose from and you have to take advantage of the services offered online. Skillshare is a great website to take classes from and you can get coupons to get free classes for a couple of months. Seminars and Workshops – There are seminars and workshops you can attend to, some for as low as Php 1,000. As was mentioned above, you can take seminars for investments in real estate and stock markets to name a few. It will also be a great way to meet peers who are interested in the same endeavors. Books – Books are investments. If you want solid knowledge on any subject matter, then buying a book on it is always a wise decision. The trick to reading a book if you’re busy is to look at the table of contents and to just pick chapters that would seem more applicable for you. This way you won’t have to read the whole book. Youtube – Youtube is a website that is truly helpful for no cost. You can learn any skill from watching thousands of free videos on any given subject, may it be Bitcoin, Forex, stocks. You name it. The site is a wealth of information you can access with just your smartphone. Filipinos are known to be risk-averse when it comes to investing. You’re probably one of those who are wondering what kinds of investments give the best return. The best investment yields high returns with minimal risk. But are there really low-risk, high-return investments in the Philippines? This may sound impossible, but you can find them if you know where to look. The key is to check low-risk investments such as money market funds and bond funds (through mutual funds or UITFs) with the highest returns. Money market funds and bond funds are both invested in low-risk, fixed-income securities. Time deposits and government T-bills comprise money market funds, while corporate and government bonds comprise bond funds. To view the best-performing investments, visit the Philippine Investment Funds Association (PIFA) website for mutual funds and the Unit Investment Trust Fund Philippines website for UITFs. 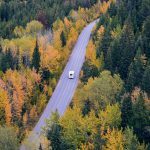 With the multitude of options provided in this article, it will be foolish to choose only one and invest all of your money in it. As what has been said earlier, putting all your eggs in one basket will be a bad idea. Pick two or more investment options. This way if one fails you can still rely on the other. More importantly, if all will become successful you’ll generate more income. Worrying too much and panicking won’t help you or your investment grow. Sometimes relaxing and taking some rest to reorganize your mind and your priorities are important too. If you think too much about failure, you’re already failing. Just sit back relax, and let matters take its course. If one investment fails don’t dwell on it too much. Especially if it’s in stocks, forex, or cryptocurrency. Expect that there will be losses. But keep a positive mindset. And it’s very vital to only invest the money you’re willing to lose. There’s no better time to start an investment but now. You’re still young so if you decide to start now, you can become a millionaire not in your 60s but in your 40s or even 30s. So, don’t just sit there, invest now! Hello Chora! I am a financial adviser of manulife philippines. I can help you realize ur investment dreams. I made a comparison matrix of popular VUL policies in the market (Sunlife, Axa, Manulife, Insular Life, Bpi-Philam/Philam Life, Prulife). 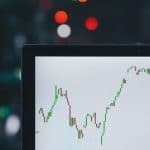 But first…..
With regards to investment, it would also be prudent for starting investors to enter pooled funds instead of direct stock trading unless he has large capital to invest in blue chip stocks, and has the time and diligence to track market movement from time to time, since one can really maximize earnings by trading. With regards fund performance among pooled funds (VUL, mutual funds, and UITF), best fund managers in the country are employed in Life Insurance Companies, which offer VUL products, hence annualized returns are higher in VUL by historical performance. And among several VUL products, there are actually few funds that really stand-out. And these funds are available only in select few Insurance Companies. Lastly, keep in mind that when Financial Planners present to you a VUL policy which would require limited-term pay (5-yr/7-yr/10-yr), it is NOT guaranteed that you will only pay up to this period. VUL is investment-linked, and all will depend on the actual fund performance. Same goes with regular pay- it is NOT true also that you will pay continuously, so look for a premium holiday feature (with no premium holiday charges). If you are interested to learn more, I was able to make a comparison matrix of all VUL products, and these cover 2-groups – Investment-Oriented and Protection-Oriented Products. I had 19 criterias as basis of for my evaluation when choosing which company gives more value to the premium (investment) that I pay, as one will be suprised that some companies charge more than other companies (and this does not include yet the hidden charges- you will only realize that it is hidden when you understand complex terminologies in the VUL policy). Example of my criterias are: fund performance (annualized ROI/assets), market capitalization, pricing policy (single or dual), protection coverages, premium and monthly deduction charges, rules on policy lapsation, effect on short-term non-payments, etc… I also made an analysis about the pros and cons of regular pay and limited-term pay. Actually, a lot of Insurance Agents offer limited-term pay since it requires higher minimum, and with higher premium the more commission. SmartCash is the best investment in the world of cryptocurrency. Believe me i’m in there! A lot of young professional’s money will get slaughtered in the first 9 of the 10 tips mentioned. Due your due diligence before making an article like this. To the yappies, follow the advice at your own peril. I’m an OFW and this article is very helpful. I like small business with small capital too. Any idea pls? thank you. Good day! I am Marjorie Anne Mena, licensed Property Specialist from Avida Land Corp., A subsidiary of Ayala Land Inc., known to be the best in Business District Development. We have lots of great condominium projects within Metro Manila, exclusive, secure, and organized residential and office community respectively, with residential, retail, medical, business, and lifestyle options or what we called “mmixed-used community”. 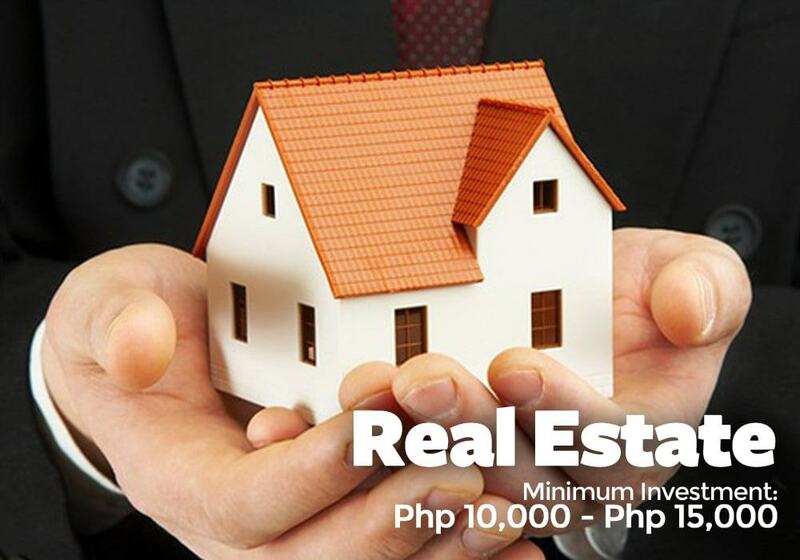 If you are interested to invest in Real Estate business, I am willing to help you get your own, now! One needs to understand the difference of Annualized and Absolute Return. It would be straightforward to make a comparison of different funds and distinguish which funds are superior or perform better if the inception dates and time duration of subject funds are the same. Without knowledge of how investments perform, an investor could be committed to an inferior investment and never even know it. An Annualized Return figures the investment’s average annual return or how much the investment has grown on a yearly basis for a specified period of time, while the Absolute Return measures the overall return for the entire period you’ve held the investment since inception date. For example, a 5-Year Annualized Return at Year 2018 will tell you how much return your investment has generated on a yearly basis from Year 2013 up to Year 2018 (5-year duration). On the other hand, an Annualized Return Since Inception will tell you the average annual return of your investment since the inception date, hence if the fund’s inception date is Year 2009, that would be average annual return for nine (9) years. Therefore, Annualized Returns are very useful when you want to compare two different funds or investment vehicles (of the same category) where time duration and/or inception dates are different. Each Insurance and Investment Company will show you numbers in the way they look attractive to them to sell it to you. But in my experience, annualized returns (with consideration of Assets Under Management) are the most effective way to calculate the returns and compare fund performance of different Variable Life (VUL)-investment linked products. If you have any questions, you may email me at: emg12316@gmail.com or you may text/call me at: 0917-5662845. Just to share a little background of myself, I currently have one (1) Investment-Oriented VUL Product, one (1) Protection-Oriented VUL Product, and two (2) Certificate of Participation for UITF. I wrote in my previous post that there are VUL Funds offered by select few Insurance Companies that have shown superior fund performance over their Mutual Fund and UITF counterparts. At this point, I would like to explain another important benefit of VUL Product- The Total Disability Waiver. 1. Note that Variable Life Policies are investment-linked products, which means that so long as the Fund Value/Account Value/Full Withdrawal Value is not zero (0) and is sufficient to cover the monthly deductions, the plan will not terminate, and the insured person is covered with minimum guaranteed benefits. The minimum guaranteed benefits in most VUL Policies are presented in Item Nos. 2/3/4 below. Is it possible to have a Fund Value less than zero (0) or negative during the early years into the policy? The answer is YES and No. If a VUL Product has no Contract Debt Feature, it is possible that Fund Value will become negative in the early years of the policy, and Policy Owner will then be required to make a top-up payment. However, some VUL Products provide Contract Debt Feature, and this will prevent the Fund Value to be negative during the early years of the policy. Therefore, always look for the Contract/Policy Debt Feature in a VUL Product. 2. What is the 1st minimum guaranteed benefit per Item No.1? This would be the death benefit of the policy. This represents the “Face Amount” or “Benefit Amount” of the policy that will be paid out on a tax-free basis to whoever the Owner and/or Irrevocable Beneficiary of the policy is. This is equal to 500% of the basic monthly premium or the Policy Face Amount whichever is higher. 3. What is the 2nd minimum guaranteed benefit per Item No. 1? This would be the accidental death benefits. In most VUL Policies, this is a built-in feature in the product already. However, there is one Protection-Oriented VUL Product that I know that offers accidental death benefits as an optional rider only, which means the rider can be detached, and therefore savings on the overall Rider Premium. The Additional Death Benefit provides additional coverage of up to 100% of the Face Amount or Benefit Amount if death is due to accident. 4. What is the 3rd minimum guaranteed benefit per Item No. 1? This would be the Total Disability Waiver. This is a built-in feature in VUL Policies without charge. This waiver of premium rider pays all Basic (Life insurance and Investment Allocation) and Rider (Supplementary Benefits) Premiums due if the insured person becomes disabled and unable to perform work. 5. The waiver of premium benefits the less well-off policy owners the most, because they would least be able to cope with paying for all future premiums if they become completely disabled, and this include the premium that is allocated to investment (cash value). This can provide the insured person with potential passive source of income (thru partial withdrawals in the policy) if the insured person becomes injured and/or disabled, hence unable to work or perform the key income producing duties. Passive income comes from earnings that one receives with little or no work required. For this case, passive income would refer to investment earnings. 6. A Term Life Insurance Policy (referred to as TERM in BTID or “Buy TERM and Invest the Difference”) is a type of insurance plan that offers financial security to the family of the insured upon Insured’s death. When the insured person dies within the period covered, his beneficiaries get paid. If nothing happens to the insured person within the term, he/she does not get anything. While optional riders can be attached to a Term Life Insurance Policy for more comprehensive coverage (similar to VUL riders), it would not still be able to level the coverage of Total Disability Waiver Benefit for VUL Product as premiums do not earn cash value. 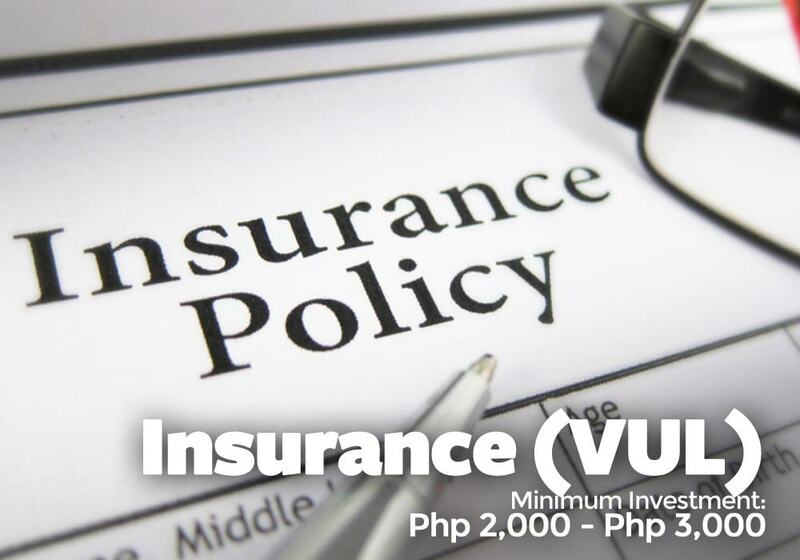 Note that in a VUL Policy, the waiver of premium includes the amount that is allocated for investment, which cannot be applied in a Term Insurance Policy. 7. In relation to Item No. 6, this is one of the reasons why VUL Products continus to be more appealing and valuable to people. A total disability or being unable to work due to injury (i.e. when a classical musician permanently injures his arm) will inevitably decrease a person’s income. When insured person becomes disabled, it makes much more difficult for him/her to save money and will impact the retirement plans. With less savings, and less ability to add money to savings, a total disability will have a significant and negative impact on a person’s net worth, which is the amount that he/she is able to save for retirement, and the amount that he/she will be able to pass along to his/her beneficiaries. In continuation on the previous post..
At this point, I would like to address a popular misconception that a VUL Policy is more expensive, and yet offers inferior benefits on the life insurance and investments of the insured person compared to BTID (Buy Term and Invest the Difference). 8. In a VUL Policy, every time one pays a premium, a certain percentage of the premium goes toward premium expense charges and the balance goes towards the Cost of Insurance and Cash Value (investment portion). Premium expense charges include administrative fees, commissions, and the life insurance company’s overhead. 9. 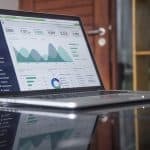 In my own opinion, I see nothing wrong with giving sales commissions to Financial Advisers or Insurance Agents, especially if they are really providing holistic and personalized service to their clients. This include regular updates on the fund performance and giving recommendations when to make fund switches or apply changes to the fund allocations in the policy. Note that same with Mutual Funds and UITF, one can really maximize the returns of his/her investments by making strategic fund switches and changes in fund allocations. Oftentimes, the facilities offering Mutual Fund and UITF Products provide only transactional service, which means that after an investor gives his/her investment, Mutual Fund and UITF Brokers/Agents may not bother to do periodic monitoring and reporting of fund performance to the investor. 10. In relation to No. 9, Financial Advisers or Insurance Agents, at their own expense, had to pass two (2) rigorous licensing exams and register with an official regulating body- in the Philippines it would be the Insurance Commission. Afterwards, they had to do several prospecting, and if successful, set meeting with their prospect Clients. Note that the Insurance Company does not pay its Financial Advisers and Insurance Agents with a daily or monthly allowance. Financial Advisers or Insurance Agents will have to spend their own money for business-related expenses (phone bills when calling the client, transportation expenses when meeting the client, internet usage when drafting and sending product proposals online, miscellaneous expenses such us purchase of coupon bonds and printing of product proposals, etc. ), not to mention the challenges they face when chasing tough potential clients. 11. When one is a VUL Insurance Agent, he/she needs to understand how the VUL system works. I have mentioned in my previous post that VUL Policies are complex insurance products. There are a lot of factors that need to be look at when a prospect client would want to make comparison of various VUL Products offered from different insurance companies (i.e. market capitalization, assets under management, annualized and absolute returns, equities, long-term/shirt-term bond pools, etc.). The responsibility of VUL Insurance Agent is to make the client understand the features of the policy and give reliable recommendations, hence diligent study of finance and wealth management is required for a VUL Insurance Agent. A VUL Insurance Agent is no different with Licensed Doctors, Lawyers, or Engineers who charge their clients with consultancy and/or service fee. If we are willing to pay Teachers, PUV Drivers, and several others for the services rendered, I don’t see the point of discriminating VUL Insurance Agents and Financial Planners. I am a Mechanical Engineer by profession, and I don’t see myself providing free consultancy services to my Clients on mechanical design. 12. The next question would be, are VUL Insurance Agents receiving big commission for every case closed? The answer is NO. The range of sales commission in most VUL Products (Single and Regular Pay) is between 2% to 30% of the annual premium payment for the 1st year, while for the remaining paying period for the premium charges, the range would be somewhere between 2% to 10%. The sales commission is only a part of the premium charges. Therefore, if the annual premium for a VUL Policy is Php 25,000.00, the maximum sales commission during 1st policy year is Php 7,500.00. If you look at the big picture, wherein your investment has the potential to grow 400% after 20 years (at 10% projected earning rate), the Php 7,500.00 sales commission is actually not a big deal anymore. 13. Note that different Insurance Companies offer different paying period for the premium-charges. Investment-Oriented VUL Policies have less premium charges and shorter paying period on premium charge, compared with those of Protection-Oriented VUL Policies. Note that VUL can be classified as either investment-oriented or protection-oriented. There are insurance companies that may require paying period on the premium-charges up to the maturity of the plan (lifetime), some could compress the paying period between 2-years to 4-years but at relatively higher premium charge rate, while others could present very low premium charge rate on the product proposal but actually have ‘additional monthly deductions’. Regardless of the paying period, it is worth mentioning that payment of premium charges is only temporary (short-term). What most BTID advocates may not be aware of is that there is actually one VUL Product offered by an Insurance Company that charges very minimal premium rate, and that would be 75% of annual premium for the 1st policy year only, which means that from 2nd policy year onwards, 100% of the premium will go toward the cost of insurance and investment (cash value). I can attest to this because this is the current plan that I own. 14. Another thing that BTID Advocates may not be aware also is that for Pure Investment Vehicles, such as Mutual Fund and UITF, there are also Premium or Administrative Charges, although they are called differently. Example, for a mutual fund there would be Shareholder Fees- these are Sales Charge on Purchases (similar with commission you pay to a broker) and Deferred Sales Charge, Redemption Fees, Exchange Fees, Account Fees, Purchase Fees. There are also Annual Fund Operating Expenses, and these include the Management Fees, Distribution Fees, and other Expenses. And as long as the investment stays in the fund, the payment of Shareholder Fees and Annual Fund Operating Expenses will continue, unlike with most VUL Products where payment period of premium charges is short-term only. 15. Perhaps one interesting feature of VUL is that it uses a Single-Pricing Method. On the other hand, Pure Investment Vehicles use Dual-Pricing Method. For funds operating a single pricing policy, the Net Asset Value Per Unit (NAVPU) is the same when you buy the fund or sell it. As a result, there will be no additional fund management charges during fund switching and/or changing of investment allocations. For funds that implement dual pricing, the price at which you buy the units, is known as the Offer Price, and the price at which you sell the units, is known as the Bid Price. A Bid-Offer Spread is the amount by which the Offer price exceeds the Bid price for an asset in the market. The Bid-Offer Spread is supposed to account for the difference between buying and selling prices that the fund manager pays when buying and selling units in the fund. A Bid-Offer Spread includes profit margin for the fund manager/s, and this is on top of the Shareholder Fees and Fund Operating Expenses. As a result, there will also be additional charges during fund switching and/or changing of investment allocations. For investors who put investments in multiple fund allocations and do strategic fund switches from periodically to maximize growth of investment, the single-pricing would be more attractive due to less overall deductions from the Fund Value. Also, most Mutual Funds are close-ended pool fund, compared with VUL and UITF that are open-ended pool funds. With close-ended pool fund, it is more difficult to make fund switches to take advantage of the movement of asset prices resulting from changing financial climate. 16. What most BTID Advocates may not understand also is that a VUL works similarly as a BTID, except that the former offers more coverage for death benefits and living benefits (thru optional riders as I explained above). Why is this so? The Cost of Insurance (per Item No. 17) in a VUL Policy is the premium that one would pay for the life insurance portion of a Term Life Insurance Policy, while the investment allocation is the lump sum or premium that one would pay to a Pure Investment Vehicle (Mutual Fund, UITF, direct stock trading) for BTID. I was fortunate to have had the opportunity and time to gather different VUL and Term Insurance Policies, and according to my evaluation, the Cost of Insurance (plus Accidental Death Benefit and Total Disability Waiver) for VUL and Term Life are just the same, while in some cases, the Costs of Insurance of certain VUL Products are lower than their term insurance counterparts. Most BTID Advocates confuse the Premium/Administrative Charges of a VUL Product with the Cost of Insurance. 17. In relation to the Cost of Insurance, while most Insurance Companies determine the Cost of Insurance based on the Insured’s gender, health, age, and death benefit amount, there is one Insurance Company that offers temporary Cost of Insurance for their VUL Policies. This is possible since the computation of the Cost of Insurance is based on the Net Amount at Risk (NAAR) to pay the death benefit. For example, if the death benefit amount is Php 1,000,000.00, and the Fund Value is already at Php 1,000,001, there will be no more Cost of Insurance as far as referred VUL Product is concerned. In the same way, when the Fund Value is at Php 999,999.00, the Cost of Insurance will be computed based on the NAAR which is valued at Php 1.00 only. Per my evaluation of the comparison matrix, all other Insurance Companies charge continuous Cost of Insurance. 18. Kudos to this engineer who made actual computations on investment returns for BTID and VUL. However, as I was familiar with the terminologies used in product proposals of different Insurance Companies, I am sure that the VUL product proposals used in the particular study came from a certain Insurance Company that charge high premium rates in comparison to its counterparts (the company requires 10-year payment of premium charges and 5-years of other monthly charges on-top). Therefore, think about how soon the investment returns of BTID will be overtaken by that of Protection-Oriented VUL Policies which charge low premium rates and shorter premium-charge paying period (<3 years). 19. We have established, per Item Nos. 16 and 17, that because of temporary Cost of Insurance, one specific VUL Product will be less expensive than BTID. To arrive at a more general conclusion to include other VUL Products that charge continuous Cost of Insurance, we should look at the bigger picture. Often, accidents and sicknesses do not lead to instant death. In most cases you just need to stay in the hospital for treatment, but it can cost a lot of money. Unfortunately, the Life Insurance will not pay the insured anything if he/she is just hospitalized. Unexpected emergencies could take a huge toll on one’s life savings or if none, can give us a lot of financial problems. That’s why one needs to be covered by healthcare insurance. VUL Products address healthcare concerns thru optional riders (i.e., critical illness benefit, hospital income benefits, etc.). These riders pay lump-sum benefits to the insured for medical expenses. Compared with healthcare plans from HMOs (medicard, maxicare, insular, etc. ), optional riders can be added to a VUL Policy Plan at much lower additional premium. A licensed Finance Planner, I can assist you to all your questions regarding any type of investments, for OFW’s I can support you thru e-mails or any type of social media, for persons working or living in Metro Manila and near provinces I can give a 1 on 1 , free coaching. All your questions and concerns will be answered. This our way me and my team to help people save and invest money in the right and proper way, Inflation runs in average of 5% annually while bank interest is .5% to 1% only, imagine how much money you are losing every year. Hi! My name is Nikki Dela Cruz and I’m a financial advisor from Sun Life. FirstMetroSec’s minimum is now at Php 2,500! Thank you very much Sir jasonacidre for the information about you duscuss. I gain more knowledge about the different business we want to put up in the future. More power. Hi if you are reading this my name is France, Im into a banking and investments. I work as Financial/ investments advisor and broker for BPI asset management and trust pati kay Security Bank Equities. I can help you start your investment fund or for diversification para nag eearn ng interest yung savings mo kesa tulog lang sa banko. I give away FREE consultation. Send me a message or an email here (edolmofrance18@gmail.com) or like and message me at my page https://www.facebook.com/wealthcoachfrance/ for all concerns about investments. It is really good that even in a young age, millennials or the youths should know how to use their money wisely. There’s a lot of things to try out and to work on. Thank you for sharing this. This just answered all my questions about investing. I think it is really good to start at young age. Thank you very much for this! Great help!